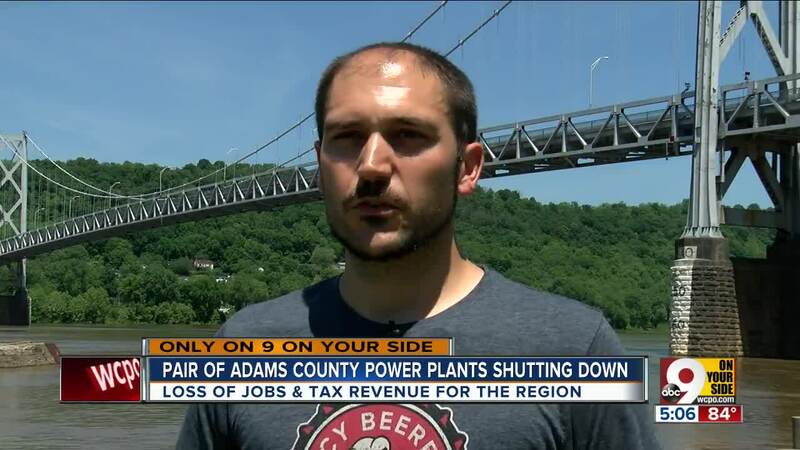 MANCHESTER, Ohio -- Two Adams County power plants are shutting down by the end of the month, ending decades of electricity generation. The loss of tax revenue from Stuart and Killen stations has already caused a lot of concern in Manchester, West Union and Maysville. The Stuart plant went offline early Thursday morning. The Killen station is scheduled to stop producing power by the end of May. The facilities closing means the region is losing hundreds of jobs. Trey Gallenstein of Maysville worked at Stuart plant for nine years, and he'll soon be out of a job. The site of the idled plant was jarring to him. "It's been pretty tough," he said. "I've got a daughter — my first daughter, she's 14 months old. My wife became pregnant right around the time we started talking about closing down." Jobs at the plants had a total payroll of $60 million. Now it's decision time for Gallenstein and more than 300 other soon-to-be-out-of-work employees. "Do we stay around? Do we pack up and leave? What do we do from here? It's a really good paying job," Gallenstein said. "Been a great job. Great work environment." Adams County Auditor Dave Gifford said the plant closings will mean belt-tightening for every local government agency. "It's going to be about an $8.5 million loss in tax revenue," he said. Manchester Local Schools relied heavily on that money, so it will take the biggest hit according to Superintendent Brian Rau. "When all is said and done, the power plants will have impacted us about $3.5 million," he said. That means a drop in per pupil spending from $12,000 to $8,000. Last year, the district had nearly 1,000 students. Now it's down to 870. Parents usually sign up 70 students a year for preschool. That's dropped to 50. "They're not disgruntled with the district, they love the district," Rau said. "The parents just have to go find work, and it's just not here in Adams County." There have already been a few layoffs and shuffling of responsibilities because of the district's new reality. "We're going to continue as a district," Rau said. "We will not need to consolidate with any other districts. We're just going to have to do business a little differently based on the budget that we have." The Adams County Ohio Valley School District will also lost $200,000 in tax revenue from a $39 million budget. 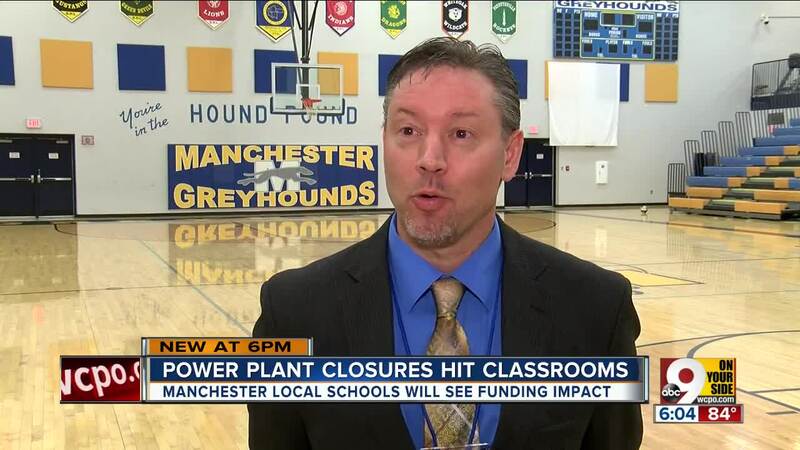 Superintendent Richard Seas said they fared much better than Manchester. "But I think the greater loss has to do with the fact that the families and the community being disrupted as a whole," he said. In West Union, county leaders have reduced spending as they try to predict what the closings will do to sales tax receipts, according to Adams County Commissioner Ty Pell. "Last year's cuts, we cut around $600,000. And projections from today, looks like we're going to be around $250,000 from the '19 budget," he said. At Mozier Furniture and Appliances in West Union, owner Gary McClellan reduced inventory in anticipation of the closings. "It's going to impact us to some degree, but it's kind of a measured degree — not a total impact, not a depression-type thing that hit is in 2008/2009," he said. At O'Rourke's Neighborhood Pub in Maysville, owner Norbert Gallenstein said about 15 percent of his business could be traced to the plants. "The payroll is what is going to hit us, where the locals make their money and decide where to spend it," he said. "We try to get a piece of that and it won't be there." The future is uncertain for businesses, schools, the government, and workers like Gallenstein. He said he's looking at trade school or just jumping right back into the job market. There have been efforts to sell one or both of the power plants, but so far there have been no takers.